These vintage frames make quite a splash, especially if a woman wearing glasses is your fetish. Compared to the simplicity of today’s eyewear, they appear truly avant garde. 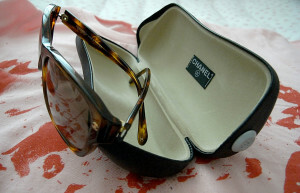 Not vintage, but I do love my Chanel sunglasses. So, be honest, what dirty thoughts have you had about a woman in eyeglasses?